Washington, July 11 (IANS) South Carolina’s Indian American governor Nikki Haley’s decisive action in getting the slavery-era Confederate flag removed from the statehouse grounds has increased speculation about her as a potential Republican vice presidential nominee. 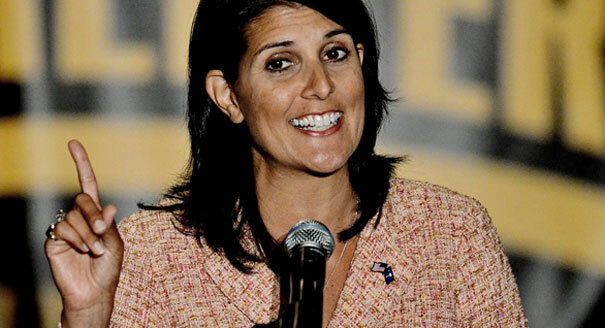 “Haley’s decisive action to drive the final removal of the banner from statehouse grounds quickly and relatively cleanly in the glare of the national spotlight proved a well-timed audition for higher office ahead of the 2016 Republican veepstakes,” it suggested. “Nikki showed leadership in this instance, and she represents a new Republican face in the South,” strategist Steve Schmidt, who managed John McCain’s 2008 presidential bid, told Politico. “Other state figures had faltered when confronting the legacy of the Confederate flag and pushing for its removal. But Haley’s quick call for it to be taken off has allowed her to bask in glowing reviews,” said CNN. “The once-rising star, whose shine had faded after her 2010 gubernatorial victory, has emerged from the flag battle as the face of the ‘new South,'” it said. Shortly after the removal of the Confederate flag from statehouse grounds, Haley told CNN that placing the flag there in 2000 was a poor decision. Haley, the youngest current governor in the US and the first woman and the first Indian American to serve as Governor of South Carolina, had previously been a supporter of the flag as a symbol of Southern heritage honouring residents’ ancestors. But it was after a week of funerals for the nine churchgoers who were gunned down by a white man in a historic black church in Charleston with the alleged intent of “starting a race war” that Haley said she decided that the flag had to come down. “The biggest reason I asked for that flag to come down was I couldn’t look my children in the face and justify it staying there,” she was quoted as saying. The flag didn’t kill the Charleston nine. But removing it should help South Carolinians move forward in its quest for racial reconciliation, she said.